I labored over this particular Charleston post a lot. Combined with getting my mind back together after the tragedy, watching the news, and discussing the Confederate flag, I’ve been feeling pretty low and, honestly, didn’t feel like discussing it anymore. But that would be shirking my duty as a chronicler of history (in my modest station), so I wanted to say something. How I wanted to tackle it was difficult. But thankfully, I’ve had people who have done it for me, probably with a lot more clarity than I could have at the time. In defense of taking the Confederate flag down, we have Sen. Paul Thurmond, among many southern leaders. It’s extremely notable that Thurmond is speaking vehemently against the flag flying around the south, since his father, congressman Strom Thurmond, is a total bigot. I think Paul knows this, since he’s clearly learned from his father’s mistakes, at least when it comes to the flag. I’m proud to take a stand and no longer be silent. 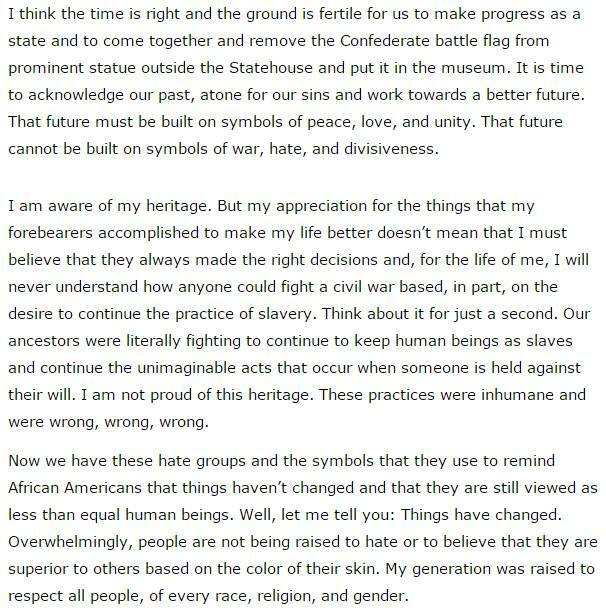 I am proud to be on the right side of history regarding the removal of this symbol of racism and bigotry from the [South Carolina] statehouse. But let it not satisfy us to stop there. Justice by halves is not justice. We must take down the confederate flag, and we must take it down now. But if we stop there, we have cheated ourselves out of an opportunity to start a different conversation about healing in our state. I am ready. Let us start the conversation. The second person who said what I need to say is President Obama. His eulogy for Rev. Clementa Pinckney was, easily, the most stirring speech he’s given since his 2007/08 bid for the presidency. It might be his best speech ever. He was able to weave in the discussion about racism and civil rights, the debate over the Confederate flag, gun policy and other polices that Congress can implement, and why the black church is so important in a world that routinely denies us black people a recognition of our humanity. I’m immensely glad these two people said what I was trying to pull up from my spirit after being angry and more stressed than normal for a full week. The only thing that these two have said that I’ll reiterate is the need for more action now that there’s been a start in the right direction. The President was right in saying that this tragedy forced hearts to open in grief, and when hearts are opened, things are able to change, such as Confederate flags all across America (not just the south) being taken down or not available for sale. Overall, I feel a lot more heartened now than I did a week ago, and it’s because I’ve been reading posts by many columnists and bloggers who genuinely want to educate people that might not know everything they need to know about racism and America’s history (particularly the American south). I’m also relieved that the Department of Justice are investigating this tragedy as hate crime and an act of terrorism, since those two descriptions encapsulate what this crime is. I’m hoping America can come out of this much stronger and something more in line with the ideals we have for the country.